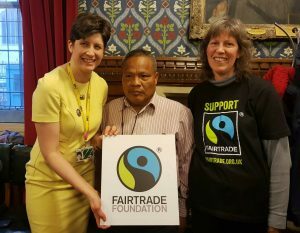 To mark the start of Fairtrade Fortnight Alison Thewliss, MP for Glasgow Central, attended a celebratory event at Parliament. The event, sponsored by Co-op, gave parliamentarians from across the political spectrum the chance to show their support for Fairtrade, chat to supporters and campaigners, hear the stories of Fairtrade producers and sample some delicious Fairtrade produce. 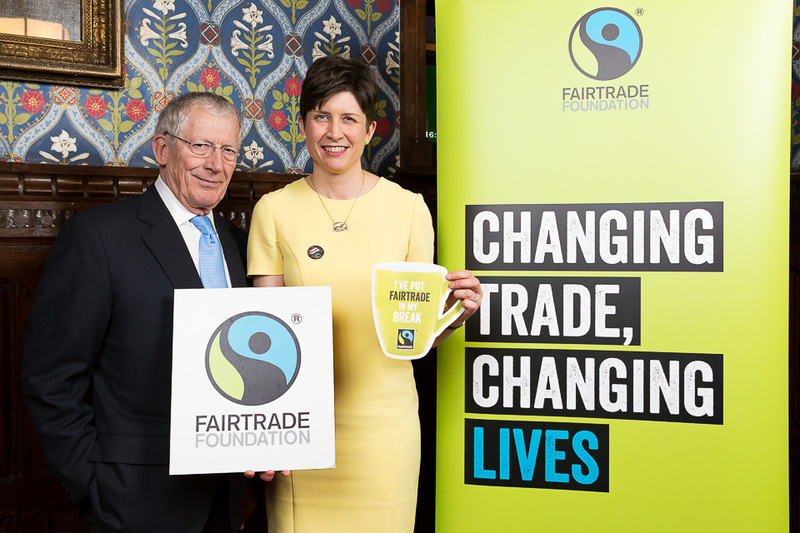 Parliamentarians also got the chance to pose for photographs with Fairtrade Ambassador Nick Hewer, famous for his roles on Countdown and The Apprentice. Fairtrade Fortnight 2018 will challenge the British public to open their doors to Fairtrade and help close the door on the exploitation facing farmers and producers in developing nations. The nationwide campaign ‘Come On In’ runs from Monday 26 February until Sunday 11 March and will invite the public to come in to the world of the people who grow our food to see what life can be like when farmers and workers aren’t paid fairly. The campaign will explore how businesses, farmers, workers and shoppers can come together through Fairtrade to change this. Thousands of events will be taking place around the country including breakfasts, breaks, bake-offs and more as people ‘Come On In’ and find out more about Fairtrade. “It is wonderful to be able to show my support for Fairtrade alongside my fellow parliamentarians. “Fairtrade Fortnight is a hugely important event and I would encourage the people of Glasgow to get involved wherever they can. “This Fairtrade Fortnight, we are inviting people to ‘Come On In’ to find out what Fairtrade does for farmers and see what exploitation looks like when trade doesn’t deliver. “There has never been a better time to stand alongside the people who produce the things we love to eat, drink and wear. People who often do not earn enough to feed, or provide for their own families. “From selling the UK’s first Fairtrade bananas and the world’s very first own-brand product with the Fairtrade Mark, through to making entire own-brand categories Fairtrade we at Co-op have continued to drive the benefits of Fairtrade. We will continually look for ways and areas that we can develop to help make positive impact and life changes for farmers in developing countries. “Last year we extended our commitment further in a retailer first and announced that all the cocoa sourced for own brand products will be sourced on Fairtrade terms. This year we will be increasing our sourcing of the other core Fairtrade commodities to drive further Fairtrade Premium to producer communities. Our recent move saw us become the first in the world to adopt the new Fairtrade Sourced Ingredient program on flowers, meaning that all the African roses Co-op sources for use across our entire flower range will return a Fairtrade Premium. Some 35 million Co-op rose stems a year are now certified as Fairtrade and will go to help graduate nurses find employment in Kenya. “As a responsible business, we believe in doing the right thing and are incredibly proud to be a long-standing partner of Fairtrade. “A number of our products, including coffee, tea, sugar and bananas, are certified Fairtrade and we continue to add more items to the menu, including green tea and peppermint tea more recently.